I really enjoy history. Recently I completed a commission for a map that will be used for a film documentary about George Rogers Clark. The documentary covers the expansion of US territories shortly after the Revolutionary War. I was asked to make a few versions of the map so that the territories can morph into the present states. It was interesting to see how strangely shaped some of the states were, because the colonies had claimed huge swaths of land that no one had really explored yet—and some of those claims were disputed with England and Spain. 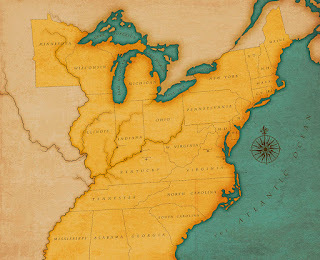 The first map shows the United States circa 1780, and the second shows the same territories circa 1860 as states in their more-or-less present form. There is a bit of a wonky character to most maps from that time period, because they didn't have extremely accurate ways of mapping large territories. Because of this, I didn't worry too much about getting the map as accurate as possible. And in some places, I gave preference to the drawing on older maps, especially where they were distorted. It gives it an added vintage quality, which is what the filmmakers were going for.